What you need to know. And then some. Our Camp Parent Resource page is here to provide information and answer many of your questions. 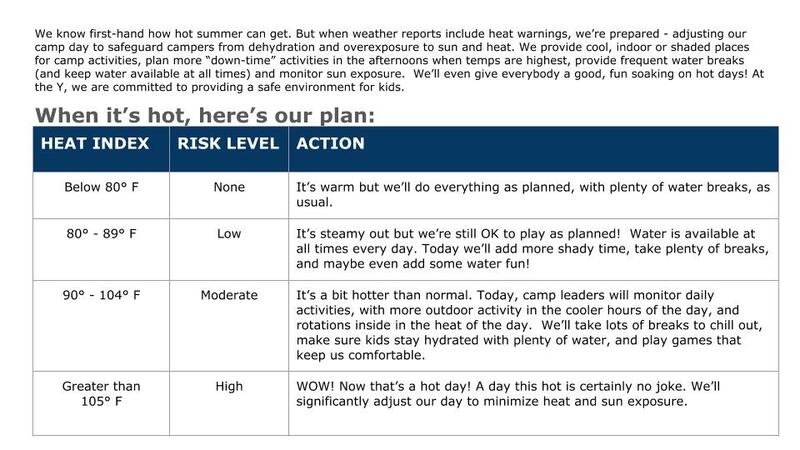 Take a look at the information below to help you navigate YMCA Summer Day Camp. If we are unable to answer your questions please reach out by calling or emailing the YMCA. Adding a week or an “add-on” session: Did your camper have so much fun that you want to add another week? Or perhaps you want to enroll them in one of our day camp swim lesson add-ons? You can register on-line here, or stop by the front desk so that one of our membership staff can help get your child registered. Cancellations: Cancellations require written notice 1 full week (7 days) prior to the start of that week or session, and are processed by our business office staff only. If you need to cancel your registration in a program or in a week of camp, stop by the front desk, or send an email to the person who represents your location below. PLEASE NOTE: If your cancellation request is made within the 7 day window, or if you don’t cancel prior to the start of the session, you will be responsible for the full payment.